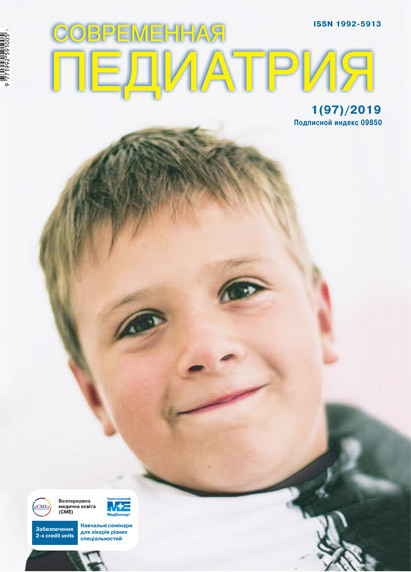 The Sovremennaya Pediatriya is a leading peer-reviewed open access national medical journal that advances innovative and contemporary pediatric research and serves as a practical guide for pediatricians and other medical professions associated with pediatric healthcare. The Sovremennaya Pediatriya is an official scientific and practical journal of the National Medical Academy of Postgraduate Education, State Institution “Ukrainian Institute for Strategic Studies” and Ministry of Health of Ukraine, printed eight times a year, in February, March, April, May, September, October November and December. It has been continuously published since 2003. The Journal seeks to publish high quality original articles that are immediately applicable to practice (basic science, translational research, evidence-based medicine), results of original research, clinical observations (brief clinical case reports), special featured articles in the field of pediatrics, as broadly defined, invited medical reviews, summaries of workshops, conferences, symposiums, congress, expert commentaries, novel insights into clinical and academic pediatric medicine related to every aspect of child health. The content of the journal also includes related fields such as nutrition, pediatric surgery, public health, child health services, basic sciences, psychology, psychiatry, education, sociology, and nursing. The languages of the journal are Ukrainian, English and Russian. The journal is based on independent and unbiased double-blinded peer-reviewed principles. Only unpublished papers that are not under review for publication elsewhere can be submitted. The authors are responsible for the scientific content of the material to be published. The Journal reserves the right to request any research materials on which the paper is based. Printed copies of the journal are distributed during scientific and practical activities (live events), presented in all leading scientific institutions and medical libraries in Ukraine. All articles are also available in PDF, HTML format on the journal website (URL), websites of National Library of Ukraine (URL), Ukrainian Scientific Citation Index (URL) and are made freely available immediately upon publication. The Sovremennaya Pediatriya is published in Ukrainian, Russian and English 8 times a year. The Editorial Board of the Sovremennaya Pediatriya and the Publisher adheres to the principles of the International Council of Medical Journal Editors (ICMJE, http://icmje.org/), the World Association of Medical Editors (WAME, http://www.wame.org/), the Committee on Publication Ethics (COPE, https://publicationethics.org/ ). SOVREMENNAYA PEDIATRIYA is an open access, peer-reviewed scientific journal that considers articles on all aspects of perinatology and pediatrics. The main aim of the journal is to contribute to the dissemination and exchange of scientific research data, improvement of professional skills of health care providers and child health care. The journal serves authors and readers of the general medical profession as well as the specialists in perinatology/neonatology and pediatricians publishing original research articles, clinical observations, special feature articles, and topic reviews. Mazur Artur, Doctor of Medical Science, Professor, University of Rzeszow, Warsaw, Poland. Yankovskyi Dmytro, Doctor of Biological Sciences, Professor, General Director LTD «Firm «O.D. Prolisok». SOVREMENNAYA PEDIATRIYA provides immediate open access to its content after publication on the principle that making research freely available to the public, supports a greater global exchange of knowledge. Articles can be read, downloaded, printed, and shared provided that use is for noncommercial purposes only, and proper credit is given to the authors as well as the original publisher. All articles in this journal are Free Open Access and meet the requirements of funding bodies or academic institutions. Articles are licensed under the terms of the Creative Commons Attribution-NonCommercial 4.0 International license (CC BY-NC). The journal is based on independent and unbiased double-blinded peer-reviewed principles. Only unpublished papers that are not under review for publication elsewhere can be submitted. The authors are responsible for the scientific content of the material to be published. The Journal reserves the right to request any research materials on which the paper is based. Printed copies of the journal are distributed during scientific and practical activities (live events), presented in all leading scientific institutions and medical libraries in Ukraine. All articles are also available in PDF, HTML format on the journal website (URL: http://med-expert.com.ua/publishing-activity/sovremennaya-pediatriya/), websites of National Library of Ukraine (URL: http://www.irbis-nbuv.gov.ua/cgi-bin/irbis_nbuv/cgiirbis_64.exe?C21COM=S&I21DBN=JRN&P21DBN=JRN&S21FMT=juu_all&S21ALL=%28%3C.%3EI%3D%D0%9624603%3C.%3E%29&FT_REQUEST=&FT_PREFIX=&Z21ID=&S21STN=1&S21REF=10&S21CNR=20), Ukrainian Scientific Citation Index (URL: http://sp.med-expert.com.ua/issue/archive ) and are made freely available immediately upon publication. SOVREMENNAYA PEDIATRIYA is the leading scientific and practical open-access journal in Ukraine and publishes the following peer-reviewed (duble-blind) material: original research articles, clinical and laboratory observations (case reports), topical reviews in perinatology, pediatrics and related fields, conference and congress summaries, commentaries. Submitted manuscripts are evaluated for their intellectual content without regard to race, gender, sexual orientation, religious belief, ethnic origin, citizenship, or political philosophy of the authors. The journal is published in Ukrainian, Russian and English languages. Manuscripts are accepted for review with the stipulation that they have not been published previously and are not under consideration by another publication, are in press, or will be published or submitted elsewhere. SOVREMENNAYA PEDIATRIYA does not accept multiple and duplicate submission even though the previous one was published in a different language. The authors are responsible for the scientific content of the material to be published. SOVREMENNAYA PEDIATRIYA is archived on official website (http://med-expert.com.ua/publishing-activity/sovremennaya-pediatriya/?lang_ui=en) and in the database of V.I. Vernadsky National Library of Ukraine, Scientific Periodicals of Ukraine (in the process of registration). The full text access to published papers is free. Authors have a responsibility to ensure that their publications are honest, clear, accurate, complete and balanced, and should avoid misleading, selective or ambiguous reporting. SOVREMENNAYA PEDIATRIYA reserves the right to decline to publish work if the journal determines that a significant conflict of interest exists. The journal also reserves the right to retract an article if author misconduct has been established and to prohibit future submission from any author who has participated in misconduct. SOVREMENNAYA PEDIATRIYA requires authors to disclose whether or not a research study reports the results of a clinical trial. Authors should affirm that any research involving human subjects submitted to the journal was conducted in accordance with the ethical standards, registered at the State Expert Center of Ministry of Health of Ukraine and approved by Institutional Ethics Committees. SOVREMENNAYA PEDIATRIYA is archived on official website (http://med-expert.com.ua/publishing-activity/sovremennaya-pediatriya/?lang_ui=en) and in the database of National Library of Ukraine by V.I. Vernadsky. The full text access to published papers is free. SOVREMENNAYA PEDIATRIYA follows the “Recommendations for the Conduct, Reporting, Editing, andPublication of Scholarly Work in Medical Journals” (ICMJE, updated December 2015) and is included in the listing of biomedical science and healthcare journals that follow ICMJE recommendations. Becoming ICMJE member journals, SOVREMENNAYA PEDIATRIYA may require that authors use the Form for Disclosure of Conﬂicts of Interest developed by ICMJE, particularly authors from outside of Ukraine. – Reviews and lectures, etc. Subscription is available at any post office.